Our review: Light straw with (dare we say?) tin-colored highlights, this wine has aromas of freshly cut citrus fruit with notes of orange zest. The palate is dominated by citrus flavors, but these are nicely balanced and accompanied by a gentle minerality. There isn't much of a finish, but it has a cleansing character. Our rating: This is a very nice wine, especially at this price point. Less aggressive than sauvignon blancs from New Zealand or Chile, but also without the oak cellaring common of this varietal from California. Food friendly, you can serve this wine as is, or with appetizers or a green salad. We previously rated the Tin Roof Cellars Sauvignon Blanc 2006 Above Average to Excellent, and this vintage rates similarly. Taste profile from the winemaker: "Offers layers of bright, juicy, citrus fruit flavors that gain elegance from a refreshing, underlying minerality. It’s an ideal match for lighter seafood dishes, roasted chicken, Caesar salad and mildly spiced Asian cuisines." 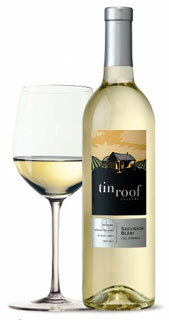 Winery website: Tin Roof Cellars.